Speech therapists work with muscle deficits of speech, swallowing and facial expressions. In addition, cognitive challenges can help increase the functioning of the brain to problem solve many of life’s daily activities. 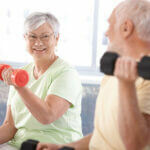 We serve in home physical therapy for seniors. For more information contact us at Wilmington, New Castle County & Kent, DE center.